Blurb: In glitzy Lake Tahoe, couples break up every day. But few are as successful as Lindy and Mike Markov, who built a $200-million business together – before Mike took up with a younger woman. Now he’s claiming he doesn’t owe Lindy a dime since they never married. Attorney Nina Reilly, struggling to make a living in her one-woman office and raise a young son alone, agrees to take Lindy’s case. Nina knows winning is a long shot, even with a brilliant jury consultant and a palimony expert on her side. It’s the kind of case – full of passion and explosive secrets – that could make a fortune for a young lawyer. Or drive someone to commit murder – for love, money … or the right verdict. Anyway, this particular installment had a quite interesting premise. It was an interesting look at palimony (something I had never even heard of). However, this book was entirely too long. I was a little frustrated when we had a resolution to the legal case and yet there was still another 140 pages left to go. It definitely could have been edited down to a page count in the 400s without losing too much of the overall story. And the way the book ended … well, I didn’t feel like it was all entirely necessary. I don’t know – just seemed to be more padding than worthy content at times. Anyway, I still enjoy Nina’s character and I most definitely look forward to reading more of her in the future. But I really wish these books weren’t quite so long. Blurb: The bloodstains on the courtroom floor belong to attorney Nina Reilly. Months earlier she’d been shot during a heated murder trial. She should have died that day. Instead Nina has returned to the same Lake Tahoe court. Her only concession to her lingering fear is to give up criminal law. She figures an invasion of privacy lawsuit is a nice, safe civil action that will help her support her young son and pay the bills for her one-woman law office. She figures wrong. Nina’s client is Terry London, a filmmaker whose documentary about a missing girl is raising disturbing questions. The girl’s distraught parents believe the film invades their privacy. But Terry’s brutal murder changes everything. Breaking her promise to herself, Nina decides to defend Terry’s accused murderer, a man she’d known years before and hoped never to see again. Suddenly the secrets of Nina’s past are beginning to surface in a murder case that gets more dangerous every day. The evidence against her client is shocking and ironclad – a video of Terry’s dying words. The only chance Nina has to save the man may be illegal. And if it fails, Nina may lose the case, her practice … and even her life. Review: This is the 2nd book in the Nina Reilly series. I read the first, Motion to Suppress, back in 2013 (oops!) I remember thoroughly enjoying that book, so I’m not exactly why it took me so long to get around to the second book. But for whatever reason …. this one was another really good book. I really enjoy the courtroom scenes in this book. They’re well written and easy to read even by a non-attorney. There were a few places where some of the legal descriptions got a little more involved than I preferred, but for the most part, it was really an enjoyable, easy read. Clocking in at 517 pages, this is definitely a little longer of a book than I usually take on, but I really didn’t notice it being too daunting while I was reading it. It probably could have been cut down by 75 or so pages, but really, don’t let the length of this book intimidate you – it’s a really interesting read that kept my attention throughout. Blurb: For more than two years, he held Seattle in a terror grip. A cold-blooded killer who abducted young mothers right in front of their sons and murdered them execution style. Then as suddenly as the killings began, they seemed to stop. Review: I haven’t read a book by Kevin O’Brien in years and I have to admit that I picked this one up now because it fit multiple challenge slots on my Goodreads groups. But I remember that Mr. O’Brien had very rarely let me down in the past so I was definitely excited about reading it. This one is kind of gruesome. Kind of scary. Kind of exciting. And full of lots of twists and turns to keep you reading all night. It sucked me in and didn’t spit me back out until I reached the end. I really enjoyed it. This is definitely a book that I would recommend to thriller lovers everywhere. Blurb: New York Times bestselling authors Gregg Olsen and Rebecca Morris investigate one of the twenty-first century’s most puzzling disappearances and how it resulted in the murder of two children by their father. Every once in a great while a genuine murder mystery unfolds before the eyes of the American public. The tragic story of Susan Powell and her murdered boys, Charlie and Braden, is the only case that rivals the JonBenet Ramsey saga in the annals of true crime. When the pretty Utah mother went missing in December of 2009, the media was swept up in the story – with lenses and microphones trained on Susan’s husband, Josh. He said he had no idea what happened to his young wife, and that he and the boys had been camping in the middle of a snowstorm. Over the next three years, bombshell by bombshell, the story would reveal more shocking secrets. Josh’s father, Steve, who was sexually obsessed with Susan, would ultimately be convicted of unspeakable perversion. Josh’s brother, Michael, would commit suicide. And in the most stunning event of them all, Josh Powell would murder his two little boys and kill himself with a brutality beyond belief, leaving a family destroyed and a nation in shock. Review: In my late teens and early twenties, I gobbled up true crime. In any way, shape, or form. I just devoured it. From books to documentaries, to CourtTV … I couldn’t get enough true crime! Then I kind of got away from it. I still occasionally catch a TV show here or there, but for the most part, I’ve really not devoted much time to my love of true crime. But then I had seen the pre-publication publicity for this book and I was immediately intrigued. So I put myself on my library’s wait list and was excited when it came in. But what I wasn’t expecting was to absolutely devour it. Like in 3 days. I learned a lot of stuff by reading this book. I remember the Susan Powell disappearance. And I remember Josh’s weird behavior. And I remember the absolute heartbreaking news that Josh had killed his two precious little boys. But I didn’t know a lot of the fine details. Which, after reading the book, a lot of people didn’t because the police never released a whole lot of information until after the case was officially closed. And by then, I’m not sure how many people were still interested. I was really surprised by how tight-lipped the police department really was. It was almost as if they didn’t want to pursue the case. Knowing what I know now, they were doing things that a lot of people didn’t know. However, I finished this book with the profound feeling that Charlie and Braden could be alive and well today had the police department done a little bit more. I know how difficult it is to progress with such circumstantial evidence. But at the same time, I think Susan’s father had it right all along … Josh would have broken down in jail. He wouldn’t have reacted to that well and I think he would have talked. Now, do I have a strong feeling as to what really happened to Susan? No. I can’t say whether I think it was an accident, premeditated, or if Josh was just a participant, not the actual offender. I do think that there is only one person alive today that knows where Susan actually is … Steve. I think Charlie and Braden saw something that night “camping.” And they were desperately trying to process it, you could see that in their behavior after Susan was missing. I think Josh’s brother Michael knew something, why else would Josh make him beneficiary to his life insurance … and why would he commit suicide when the police focused on him? This book left me with a lot of questions. But that’s the ultimate problem with this case. There are so many unanswered questions. Regardless of what you know or think you know about Susan Powell’s disappearance, I can’t recommend this book enough. It reads so easily. It’s not dry or hard to read. It puts things in such a light that you heart will break over and over again before you reach the end. Blurb:Misty Patterson only remembered the fight, the polar bear statue she used as a bludgeon, a trail of blood, and the comatose sleep that followed. When she awoke, her husband and the statue were missing. Only the blood was left. She had come to attorney Nina Reilly’s office seeking a divorce. But when Anthony Patterson was found on the bottom of the frigid lake, Misty needed a miracle. Honestly, I really enjoyed this book. There’s just something about Nina Reilly that really hit home for me. I don’t know quite how to explain it, but I just really enjoyed her character. She felt so real to me. She wasn’t perfect, but she was doing the best she could with what she had. And that husband of hers … ex-husband, now … what a sleaze bag. He rubbed me the wrong way. But it will be interesting to see what happens between her and Paul! The characters, even the secondary ones, are so well-developed in my opinion. I know sometimes it’s hard to make secondary characters seem important, but the O’Shaughnessy ladies (they are two sisters), definitely make it happen. I have to say that I wasn’t exactly surprised by the ending. I kind of had an inkling of where things were going, but I didn’t have it completely figured out until it was revealed. It wasn’t hard to figure out who was behind the threats on Nina and Misty. But what happened to Anthony, well that one was a little more surprising. I felt as if the book went along at a nice pace, it never slowed down for me. And I really felt that Nina was amazing in the courtroom – those scenes were some of the best in the book, in my opinion. Overall, I thoroughly enjoyed this first book and look forward to reading more in the series soon! More than a million readers have thrilled to Bill O’Reilly’s Killing Lincoln, the page-turning work of nonfiction about the shocking assassination that changed the course of American history. Now the anchor of The O’Reilly Factor recounts in gripping detail the brutal murder of John Fitzgerald Kennedy—and how a sequence of gunshots on a Dallas afternoon not only killed a beloved president but also sent the nation into the cataclysmic division of the Vietnam War and its culture-changing aftermath. The events leading up to the most notorious crime of the twentieth century are almost as shocking as the assassination itself. Killing Kennedy chronicles both the heroism and deceit of Camelot, bringing history to life in ways that will profoundly move the reader. This may well be the most talked about book of the year. Review: I just got a new Nook with Glowlight (for my long-time readers, you already know that I have a Nook Color – I will explain in a later post as to why I decided to get a different Nook) for Christmas. I picked it up at my local Books-a-Million on Saturday. I immediately brought it home and (impatiently) waited for it to fully charge. 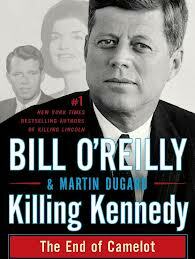 Then I was off and running and Killing Kennedy was the first book sample I downloaded to my new device. I read through the sample and immediately hit the “Buy” button. The beginning of it really grabbed me and hooked me in. I have to just state that I am a huge JFK nut. Being a history major in college, I even wrote a paper on his assassination for one of my classes. Actually, it was for History of Journalism, and I compared the media coverage of Kennedy’s assassination to that of Lincoln’s assassination. The similarities are astounding, really. But that’s a little off-topic for this review. I realized that I hadn’t read a single non-fiction book all year, and what better way to ease myself into one than this book. I found it to be an extremely fast-paced and exciting read. It definitely does not feel like you’re reading non-fiction at all. It reads more like a fiction novel to be completely honest – but that is partially because just about everything revolving around JFK can seem like it can’t possibly be true. This book leads you up to the assassination. It starts with Kennedy’s inauguration, but then it goes back and touches on his time on PT-109 (something that I’m not very familiar with). Then it goes through all the big events in his presidency (Bay of Pigs, Cuban Missile Crisis, Civil Rights) until it hits the assassination. And you learn a little about Lee Harvey Oswald and what he’s doing during these same time periods. It’s a very well laid out book and presented perfectly for everyone, whether you be a JFK expert or just a casual reader. Obviously this is a book where the ending is very well-known. But it didn’t stop me from wanting more and more. I absolutely did not want to put this book down. I seemed to be constantly reading (something that hasn’t happened to me in quite some time). Blurb: When foreign exchange student Olivia Grant is stabbed to death at a party, the accusations fly through Port Gamble faster than Twitter trending. Fingers point at frenemy Brianna and her dim-witted boyfriend, Drew. But loner and host-roommate Beth Lee may also have an ax to grind, which sends her best friends Hayley and Taylor Ryan down a twisted path to clear her name – only to discover a tangled web of shocking secrets about all of them. This particular installment in the Empty Coffin series felt a lot different from Envy did. This was more than just Hayley and Taylor’s story – there were other characters that had a big impact in the storyline. With the storyline revolving around a murder, the reader gets a lot of perspective from the local police department, including Chief Annie Garnett – a character that I personally liked. But that’s not to say that Hayley and Taylor weren’t the main characters, because they definitely were. I find it amazing what kind of trouble Hayley and Taylor can get themselves into. They sure got themselves into some precarious situations in this book. And it’s not because they’re stupid either – most of the time they knew better, but they are stubborn and determined young women. also can’t help but wonder what else can happen in little Port Gamble, Washington. That town is full of some dandy people – not just the teenagers! Plus we got to learn a little more about the twins’ “secret.” What we learn at the end of the book definitely makes me look forward to the next book in the Empty Coffin series – Guilty. There was “Truth in Fiction” section at the end of the book where Mr. Olsen discusses how a recent case in Italy (Amanda Knox) lended itself somewhat to this book. Personally, I only know the very bare bones of the Amanda Knox case, so I can’t say much about the similarities. But this seems to be a theme with the Empty Coffin series since Envy revolved around cyber-bullying and referenced the Megan Meier case out of Missouri. I know a lot of authors get their original inspiration for novels from actual headlines around our country. I actually like that Mr. Olsen includes a little information at the end of both books about what (I’m assuming here) prompted the original inspiration for the particular novel. Overall I would highly recommend this book. I think that it will definitely appeal to a very wide audience – not just the YA crowd. While this book can stand as a standalone, I definitely recommend reading Envy first so you can understand the characters better. 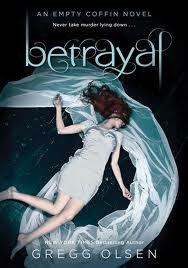 I am thrilled to announce that I am hosting a giveaway of my ARC of Betrayal AND a finished paperback copy of Envy! As always, your information will never be shared and the form will be deleted upon the end of the giveaway. In late spring of 1865, as America mourns the death of its leader, Washington, D.C., police detective Temple McFadden makes a startling discovery. Strapped to the body of a dead man at the B&O Railroad station are two diaries, two documents that together reveal the true depth of the Lincoln conspiracy. Securing the diaries will put Temple’s life in jeopardy-and will endanger the fragile peace of a nation still torn by war. Temple’s quest to bring the conspirators to justice takes him on a perilous journey through the gaslit streets of the Civil War-era capital, into bawdy houses and back alleys where ruthless enemies await him in every shadowed corner. Aided by an underground network of friends-and by his wife, Fiona, a nurse who possesses a formidable arsenal of medicinal potions-Temple must stay one step ahead of Lafayette Baker, head of the Union Army’s spy service. Along the way, he’ll run from or rely on Edwin Stanton, Lincoln’s fearsome secretary of war; the legendary Scottish spymaster Allan Pinkerton; abolitionist Sojourner Truth; the photographer Alexander Gardner; and many others. Bristling with twists and building to a climax that will leave readers gasping,The Lincoln Conspiracy offers a riveting new account of what truly motivated the assassination of one of America’s most beloved presidents-and who participated in the plot to derail the train of liberty that Lincoln set in motion. Review: I originally saw this book on LibraryThing’s Early Reviewer program a couple of months back. I was immediately intrigued – pretty much anything with the name “Lincoln” will get my attention. I was incredibly sad when I didn’t snag a copy. I checked to see if my local library had a copy on order – they didn’t. Then I decided to see if maybe it was available on NetGalley (a service that I rarely use because I really do not like reading e-books). I was encouraged when I found that it was listed – and was even more thrilled when I got accepted for a copy! I got my Nook Color out, dusted it off, charged it up (because I honestly don’t think I had turned it on in over a year) and loaded the book onto it. Then I let it sit. For weeks. Finally I realized that if I wanted this review to get done around the release date, I would have to get on it. My feelings on this book overall are mixed. I need to start out by saying that, for me, this book started out extremely slow. Like to the point where if it hadn’t been a review copy, I probably never would have finished it just because the beginning was that tough to get through. But I carried on … and I can honestly say that I am very glad that I stuck with it. It was about 75-100 pages in when it started to really get interesting. While reading this book it didn’t really feel that much like a historical novel. Obviously it was, seeing as how it was set in 1865, but there was something about the language that didn’t make it seem historical. The context was there, but the language was not, I suppose it the best way for me to describe it. Personally, I liked that. I tend to shy away from anything that has flowery descriptions of things or that has wording that is harder for me to understand because of the differences in the wording we use today versus what was used in the past. This book didn’t have that feel to it (which might have some historical fiction fans upset). I’m not 100% sure, but I think part of the reason why I get that vibe from this book is simply because it was written by a man. All the historical fiction that I have read (and trust me, my experience with the genre is limited) has been authored by women. Either way, it doesn’t really matter because I enjoyed the book. I liked the characters. Temple and Fiona are a good couple, they definitely compliment each other perfectly. Poor Temple, he was always ruining his boots – much to the chagrin of Fiona!! I liked Augustus as well. Having a black man play such an important role in a white couple’s life during the 1860s was quite interesting. They truly considered him a friend and I liked that, particularly since it was set in the immediate aftermath of the Civil War. I don’t think that made much sense, it’s really hard to find the wording for my feelings on this. The “mystery” of this book was interesting. It obviously revolves around the diaries that are mentioned in the blurb above. It was neat seeing the cipher be broken bit by bit throughout the book. And there sure were a lot of people in D.C. that wanted those diaries covered up! It definitely made for some exciting moments. My only complaint is that I would have liked to have had more information on what was in Mrs. Lincoln’s diary than what the reader sees. The ending of the book …. oh, how do I explain this without giving too much away. Let me start with this – the ending frustrated me! I guess I wanted more closure than I felt like I got. We never know who Maestro really is. I have a pretty good guess just by the clues that are given about him, but I have no concrete evidence as to if my suspicion is correct. And that irritated me! However, having said that, I suppose it adds to the suspense of the overall story. Overall I would highly recommend this book. I’m glad that I persevered through that slow beginning and finished the book. It might technically be a historical fiction book, but I really think it will appeal to the thriller/suspense crowd as well.